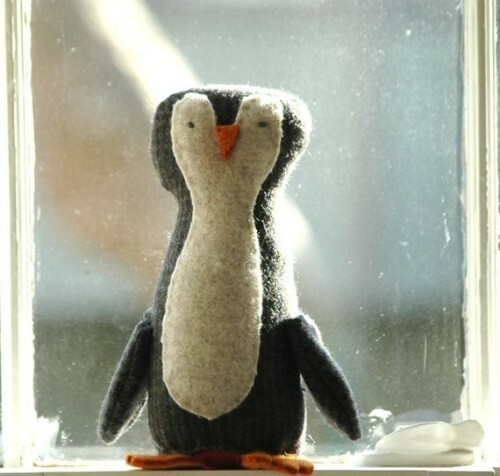 As soon as I saw this penguin on Lori Nichols' Etsy shop, I was smitten. Then I read the description and I just had to share. Alabama artist, Lori Nichols makes these adorable wool critters inspired by nature and her three girls. Pig Jo , available for $38 is pure smile inducing while Penguin Peggy (already sold) is based on a drawing made by Lori's 9 year old daughter, Zoe and 75% of the proceeds of Penguin Peggy will go to her college fund. What a wonderful mother daughter team effort and it helps teach Zoe where there's a will, there's always a way. My niece Kristen would love this cat. His name is Oscar and can be found here for just $42. Hilda Mae, an adorable pink wool bunny makes you want to snuggle while Wolf Walter appears up to no good is priced at $48 and don't forget sweet Clarence the Raccoon, just $38 here.